A lot has already been written about Kathryn Bigelow's display of torture in Zero Dark Thirty. Most of it either supporting the director's choice because it depicts the reality of U.S. operations post-911 or criticizing it because waterboarding did not lead directly to Osama bin Laden's execution. To me, both are valid arguments, but their superficial opposition foreshortens a good understanding of the film. That short-step analysis, with a small political skirmish between the right and left, means that neither argument touches on what is really interesting and misguided about Bigelow's film. What matters is that her fictionalized account strongly and narrowly suggests that the violent U.S. operations over a decade were legitimately in pursuit of one man, however errant they may have been when occupied with other theaters of war in Iraq, Afghanistan and around the world. Maya (Jessica Chastain) is a unique CIA operative whose high-minded and obsessive dedication to task approaches a police-like megalomania that is almost juvenile. (Note her dry-erase scribbles on her bosses office window.) In a way, her naive determination represents a purer America. Not an innocent America, but one that is purer in motive. An America that the world probably wishes it had seen after 911. Determined. Single minded. Hopeful of success. Just. The legitimate U.S. reaction to 911 probably should have been a planned global police operation with officers like Maya who would have sought out bin Laden and al Qaeda with cold detachment and would have brought them to justice. Instead, the U.S. raged to war in Iraq, Afghanistan and elsewhere. Maya represents the road-not-taken, a global police action towards a just end. It's a compelling one that was widely suggested by world leaders and the U.S. left in the weeks and months after 911. In hindsight, and after billions spent, it appears to have been the better choice. Bigelow's big switch, and the main fiction of the film, is that she pretends the police pursuit is the road we actually took. Along the way, Zero Dark Thirty nearly turns the War on Terror into collateral damage in the pursuit of bin Laden. At best, this is a questionable take on history. At worst, Bigelow's choice could be seen as heavy propaganda out of the Pentagon and their first hand accounts. Before I wrote this article, I wanted to write against Bigelow's explicit and exploitative depiction of torture. But the film doesn't exactly point to this reaction. Instead, we are left feeling unsettled and grim over a take on history that is somewhat accurate, somewhat truthful and somewhat wrong. That is, until an agenda can be pinpointed. The agenda, I believe, is hope. At its core, Zero Dark Thirty is a hopeful film, though it is the slightest, least nourishing version of it. Bigelow wants to salvage our troubled nation after more than a decade of misguided policies by hooking the grand mistakes to a winning end. Can the execution of bin Laden justify the whole mess, with a few apologies for mistakes along the way? If this is the effort, and I think it is, then Bigelow's argument is subtle, thoughtful, powerful... and not a little misguided. Sometimes even when you're right, you're wrong. Zero Dark Thirty shaves truths from a bigger picture, which means she can confidently and legitimately say that the film shows a certain truth about the years before bin Laden's execution and factual accuracy about the day of the operation. Bigelow's opening salvo is telling, and notable for not being the standard caveat about being based on a true story. It reads: "The following motion picture is based on first hand accounts of actual events." This is an admirable assertion and a bold statement about the truthfulness of her take on the story. But first-hand accounts of actual events cloud a giant truth that undercuts the film: the U.S. cannot salvage these years of torture and war, no matter how positive the end result. The truth of this time and its gruesome immorality stares back, and no amount of hope or vision can change that. Bigelow's corrective logic is not hidden in the film and is not an "agenda" in a conspiratorial way. It's on display. At the opening of the film, Maya is new to the battlefield, but she is also ready to take on her proper role as torturer and seeker of information. She shows some mild squeamishness when she sees the terrible methods employed by Dan (Jason Clarke), her CIA counterpart. She even tells him and CIA Station Chief Joseph Bradley (Kyle Chandler) that she was sent on this mission against her will. But there's never a question whether or not she will do her duty, even though she knows the interrogations are a sham. Dan tells her directly that their captive, Ammar (Reda Kateb), "will never get out." There is no deal. There is no possibility of redress. And yet a clue to Bigelow's hope emerges right during a torture scene. Maya tells Ammar, "You can save yourself by being truthful." Again, Maya's pure, or purer, America shines through and here is the switch. If only the tortured man will tell us the truth, we will be free of this terrible experience. After Maya said this, I was left wondering if she really meant the truth about al Queda that she and Dan were asking for, or if it was something else. Was she asking for the truth about why the U.S. was attacked on 911? Or, even more naively and quasi-philosophically, why Muslims "hate our way of life"? By not saying, "Tell us what you know about al Queda," Maya opens the conversation to a broader truth that she seeks from Ammar, and the moment becomes almost tender in a melodramatic way. Bigelow gets a little blurry eyed about this fictionalized account of "enhanced interrogation techniques." Ammar, the tortured man, does eventually get some kind of redemption after all. We see him later in the film and his wounds are healing. He is out of the Black Site and on a veranda with other people. He appears almost as a free man. After he is served several plates of food, he tells Dan and Maya everything they want to know. It's perhaps the single most profound fantasy in the film. And it rings loudly as the happiest possible ending to a terrible story. The trouble is, this did not happen like that in the lead up to bin Laden, as official accounts have revealed. And more than that, this type of confession, almost clean to the extent that the enemies chat like civilized people across a meal, does not happen through torture. The final frame of the film shows Maya sitting alone in a military transport plane. She straps herself in and looks directly at the camera. Slowly her eyes well up with tears and then large drops stream down her face. Maya is America crying. But the emotion is vapid and small. Alone, she cries silently from relief or perhaps from the release of all the energy it took to get bin Laden. But it really doesn't matter why. The point is, her crying feels almost emotionless and has an air of manipulation. 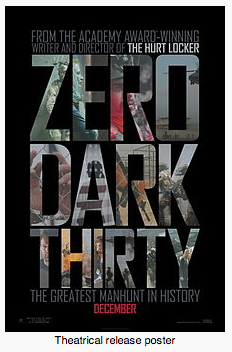 Perhaps that's the word on Zero Dark Thirty. Bigelow is not able to have her country back, nor the hope it once inspired. She's not able to take us down that path we should have gone so many years ago. The path of justice for the 3,000 killed on that September day. That opportunity passed long ago. In the end, I almost admire Bigelow's supreme effort to reach for a new and hopeful reality. But it feels false. And the influence of the Pentagon, or at least Bigelow's consultations with those who gave "first hand accounts," is noticeable. We are left with an unsettled sadness of buried regrets, deeper denials, and the thinnest strand of hope that we will one day surmount these terrible deeds.